Since Microsoft announced they were buying Datazen, I wanted to check out the application. I am interested to know about Datazen’s feature set, and how it compares to functionality in Excel with the Power tools and Power BI Preview. Datazen is comprised of two applications, the Publisher and the Viewer. 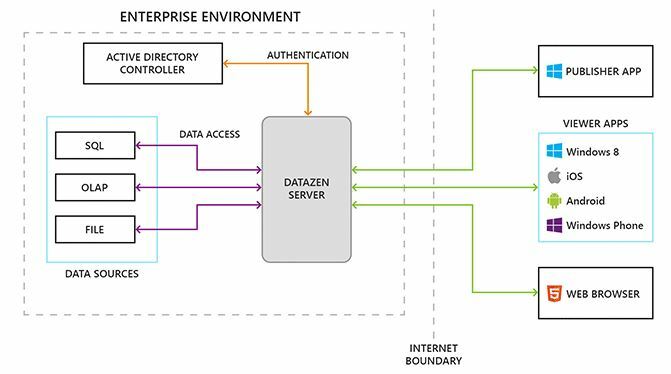 To create reports, one must install Datazen Publisher and that application will need to use the Datazen Server to make data connections and provide security. I have included a diagram from DataZen’s Website to describe how it is meant to be configured. The publisher is meant to use the Datazen Server, which is where the connection to your data is made. All of the client communication with the server is performed using a Web App which uses IIS. If you have an Enterprise copy of SQL Server with active Software Assurance coverage, you are in luck. You automatically have the ability to install Datazen Server for no additional cost, which you can do here. What if you just want Microsoft to host the Datazen Server for you, do you have to install a server? The answer to that question is yes, because the Datazen Hosted Service is listed as “Coming Soon” (scroll down to the bottom of the page if you click the link). 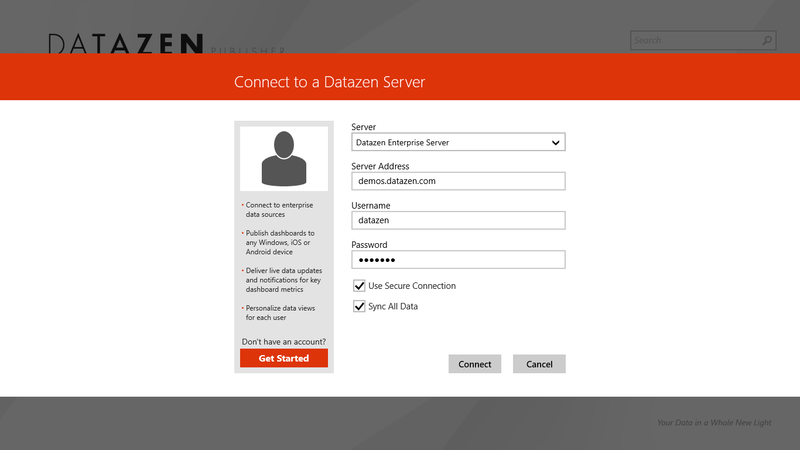 You can of course install Datazen to Azure, which will make it cloud based. To design a dashboard, you will need to install the Datazen Publisher application. While Datazen visualizations can be viewed on Apple and Android devices, to design those visualizations, you will need to use the Windows only client. And by Windows, they mean Windows 8. While I have a machine with Windows 8.1, it’s not my favorite OS, and I work a lot on my Windows 7 PC. I won’t be using that PC to create Datazen reports. Datazen now offers a preview version of the Datazen Publisher, so I assume that the market demand pushed them to support Windows 7. This version is not a released version, but a preview, so you may have some issues with it. Datazen is designed to be an application to run on Phones and tablets. The software is installed in the same manner phone apps are, you need to go to the Windows Store to download it, rather than click on a link to the site and download it, which is why you need Windows 8. If you can’t find the store, just go to the start screen and search for Store, which is what I had to do. Once in the store, search for Datazen Publisher, which is free. After Datazen Publisher has been installed, when you run it you will be prompted to connect to a server. If you don’t have a server, no worries, Datazen provides a demo server for you. The data which is entered by default the first time you run Datazen, as shown below, provides a connection to this server. To connect, just click on the Connect button on the screen. You will be asked if you want to let publisher run in the background. Generally speaking, click on the Allow button. If you do, you will get updates which have been made to the data sources. I received 31 updates after I installed it. Initially you will see KPIS, Top Dashboards and other sample dashboards which have been sorted by sector provided to show the breadth of things available. Datazen has two basic categories of visualizations, KPIs and Dashboards. KPIs are designed to provide tiles of a single metric, optionally compared to a target or range. You have the ability to comment on the results too, which is a novel ability that I have not seen in other products. Dashboards provide a typical visualization which allow for contextual selecting interactivity to see different detail on the same screen. To create your own, right click anywhere on the screen and a toolbar will appear at the bottom of the screen. Click on the create button and you can start either creating from an empty dashboard or starting from the existing dashboard. I will be exploring both of these options in an upcoming post to my blog. If you are interested knowing exactly when that will occur, I recommend subscribing to my blog so that you can be notified when exactly that is going to happen.